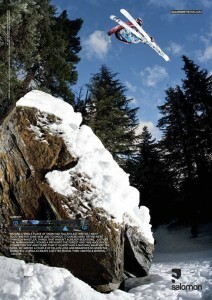 In 2009 I teamed up with the PBP crew to shoot a jib setup that I had found before the season started. The setup was a double bomb drop, one drop followed immediately by another one into some trees. I thought I’d take a bit of time to go over my thought processes when I’m shooting something like this. Unfortunately I can’t show you the final shot from the shoot but you’ll see it soon enough…. One of the first things you want to remember with this stuff is to try and make the setup look good. Take the time to make things look nice for the cameras. In this case it was being filmed too so it needed to look neat and tidy but even if I’m just shooting stills , its a good idea to keep it clean and tidy. Put square edges on your jumps and landings and try not to put unnecessary footprints in the background. These things wont always end up in your shot but if you do the work beforehand, once you have started shooting you won’t have to stop halfway and fix something up just because you have changed angles. Next up, pick an angle or two. Normally I find there is one angle that jumps out at me as “The one”. I’ll fire off a couple of test shots shutter priority set to 1/320 (max sync speed on my canon 1DMKIIN) so I can get an idea for the angle and also what the exposure is going to be. Then I’ll stick the camera in Manual at 1/320 and guestimate f-stop for the ambient exposure I’m going to need to underexpose by a stop or two in order to stop ghosting. The exact amount or underexposure really depends on how much ambient is hitting the feature , in this case the rock was actually pretty well shaded so i hardly needed to underexpose the sky by much at all and the rock was almost totally dark. We were also shooting at the end of the day so the sky had a nice deep color to it. Now I know what my exposure setting is going to be it’s time to get out some lighting kit. I shot this with 4x Nikon sb80DXs and one Elinchrom Ranger RX. The SB80s were on dual brackets with each pair fired by one pocketwizard. Note though that just because they are on the same bracket doesnt mean they have to be aimed at the same subject… In the final scenario here, all 4 SB80s were aimed at different points by swiveling their heads around. The next two photos show some of the differences that light placement can make. The first setup had the ranger behind me, 2 SB80s on the left firing up at where the rider would be and then 2 more SB80s on the right firing up at the rider. This looked pretty crap though, not enough contrast in that rock and just pretty dull looking. The ranger was pointing far too close to the same direction as the camera was so there were very little shadows cast on the rock and the moss. FAIL. Now we’re getting somewhere. I got one of the riders to stand on top so I can get a feel for the shot and make some fine adjustments to the lighting. Have them throw a snowball so you can see the trajectory and then you are good to go! All of the flashes I was using have a fast flash duration at full power, fast enough that I can confidently leave them at full power for most things as in this case. Then all you have to do to adjust your exposure is alter the distances that the flashes are from the subject or use the zoom function on the flash head if it has one. Doing this quickly is just a matter of practice, I don’t use a light meter for any of it. After a while you’ll be able to get your exposures and distances pretty dead on very quickly. Time to drop! Video courtesy of Jeff Thomas/Poorboyz Productions. PBP bomb drop from Dan Carr on Vimeo. Once I have the strobes where I want them for the shoot I tend not to move them until I have the shot I want fromt that angle. What you will normally find though is that there are some good lifestyle opportunities as the riders go about doing there thing. The exposure for my shot was going to be f10, 1/320 at iso 200. That would properly expose the rock and the rider for the action shot but by following the riders round with a longer lens and simply adjusting the aperture as they got further away from the strobes, you can usually grab a couple of lifestyles if you are quick. These 2 shots of Dane Tudor and Charley Ager were shot entirely by using the lighting setup for the action shot. Nothing was planned, I simply reacted to where they were and quickly adjusted the exposure. So when i wrote this post, I couldn’t show you any of the action shots from the shoot. I needed to wait and find out if any of them were going to get used for commercial uses or in magazines. As it happens, the best shot from this shoot was picked up by Salomon to use as an international advert for one of their new skis, the Suspect, and you might also see it crop up as a poster for one of their top skiers, Dane Tudor.